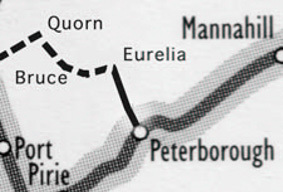 Way back in 1994, I was asked by a bunch of people I knew to see if a run of section cars would be possible on the railway line between Peterborough and Eurelia in South Australia's Mid North. At the time, I was involved with the Steamtown group, and was able to gain some assistance from a colleague, Don Smith, in pulling the event together. We developed a simple proposal for the Committee of Steamtown, and after some discussions, the idea was given approval. This led the way for future runs over the railway line, both as part of an annual event, and under the "work-for-ride" idea. The first event was simply a run to Eurelia, camp overnight and run back. The second, in 1995 was a work weekend whilst 1996, 1997 and 1998 were expanded to include a Country and Western Music night, at the Goods Shed, as well as a train up and back. I did not attend the 1995 and 1998 event. Steamtown's "Partyline" (No 62, Summer 1995) reported that the 1995 event attracted 4 cars, including an A5, an STT, an MT14, and an M15 from Steamtown. The report also refers to trackwork at Orroroo and Eurelia. There were several different performers at the nights, including Misty Mountain. The event fell over after 1998 as there was little interest in completing the work to run such a show, and the section car operators had become jaded sharing the weekend with the music. Steamtown also allowed people to operate their own section cars when working on the line, which further detracted from an organised event. 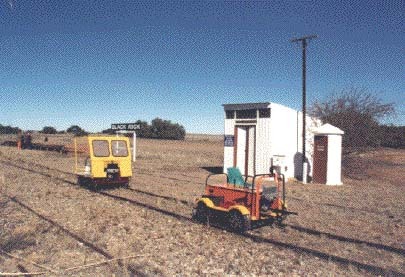 Steamtown must be acknowledged as the pioneer of the (South Australian) tourist railways in allowing privately owned section cars on their tracks. Heres a video of the 1996 event. Steamtown was disbanded at a General Meeting in November 2003. The assets, held by the Corporation of Peterborough since the Big Spit of the early 1980s, is set to form a static display as a "committee of council". Work in December 2003 was undertaken to assess the feasibility of re-commencing rail services on the line. As of Mid January 2005, Steamtown, Peterborough Railway Preservation Society Incorporated, legally ceased to exist. The photograph shows M116 and M7, both now part of my fleet, doing some preliminary work for one of the events.